Bart Christner, Associate Professor, Visual Arts, has been invited to visit Omag, Northern Ireland, on or about March 10 -16, 2008. He will be there as a guest of the Tyrone Donegal Partnership, a Euro Cross Boarder Initiative. The Partnership has contracted with DBC to provide training in Digital Media entitled the Florida Multimedia Program for approximately 20 students from this part of Northern Ireland and the Republic of Ireland. He will be there to meet the students recruited for the program and iron out any curricula concerns the Partnership may have. This will be the fourth year the college has implemented this program which will begin in April and end in June. In addition to the training in multimedia, the students will receive training in employability and cross-cultural skills, conflict resolution and other related subjects. While in Ireland, Mr. Christner will also explore the possibility of developing relationships with the colleges and universities in the region. The Partnership will pay for all of the travel expenses for Mr. Christner with possible miscellaneous costs covered by college travel funds. 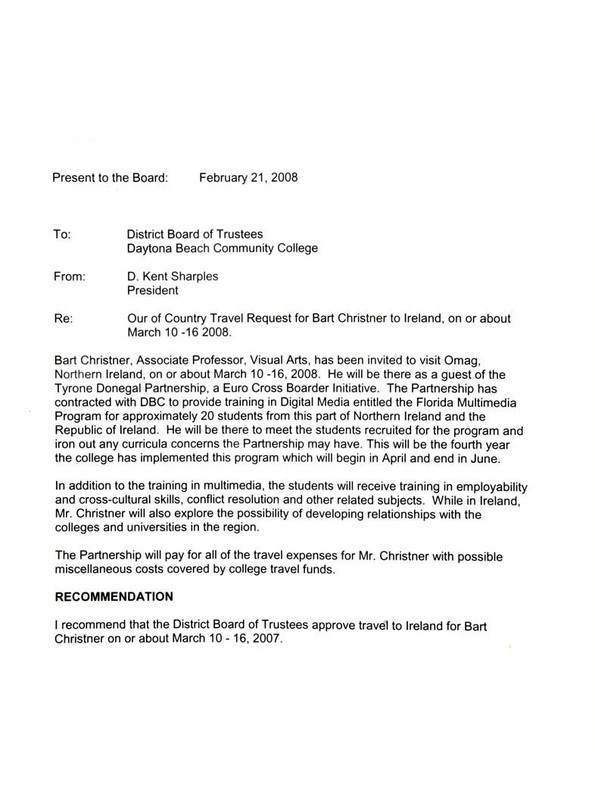 I recommend that the District Board of Trustees approve travel to Ireland for Bart Christner on or about March 10 - 16, 2007.